Do You Want Me To Review Your Product? If you are a company or business which would like to to contact me regarding sponsorship or product reviews please do not hesitate to click the button to contact me. Moisturized my feet very well. Only available in select Wal-Marts. I had to go to 3 different locations to find them. Overall this product made my whole feet feel much better. I think it would be great for the winter months. 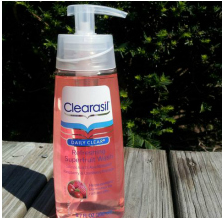 Clearasil Daily Clear Refreshing Superfruit Wash is a gentle cleanser that helps prevent blemishes. It contains a blend of raspberry & cranberry extracts, known for their antioxidant properties, and Vitamin B3. This foaming cleanser is infused with a refreshing fragrance you will enjoy using every day. Fragrance: The scent and is absolutely refreshing. Results: I have oily skin and this takes everything off without making my skin dry. I've been using Clearasil products on my face for many years now, and it's always been a reliable brand. This product has recently became one of my favorites and a must have. I've never experienced any irritation from Refreshing Superfruit Wash. I love the way this product works! It is so invigorating and smells absolutely amazing! My skin feels so clean after each use. The cleanser smells delicious; it has a raspberry scent. My teenage cousin was breaking out and within a week her face was clearing up..all the little under the skin blackheads were gone. My Experience: Since this conditioner is thick enough to be moisturizing and thin enough to be good for cowashing, I used it for both. I also used as a leave it. With very little product applied I was able to finger detangle with ease. Fragrance: Fantastic scent very delicious. Like a sunny summer day all year around. Results: Works really well and leaves my scalp feeling so clean. Left my hair with no frizz and defined curls. My hair is full of shiny and has lots movement. Afterwards, my hair is soft, smoothed, and moisturized without feeling weighed down. Price: For under a $1.00 it's very inexpensive with super results. Final Thoughts: I love the results, they are simply amazing!!!! Plus the price can fit everyone budget. A very great detangler & curl definer as well. No company has told me what to say or how to say it. All conclusions formed by my honest opinion. Use all information, opinions, and advice at your own discretion. All suggestions, tips, prizes, techniques and advice given are for informational purposes only and should be used at your discretion and best judgment. I highly recommend conducting strand tests when trying or using new products, hair appliances and product mixes. Please consult with a professional hair stylist before making any major changes to your hair.